I've gone a little radio silent this week due to an unscheduled trip back home. 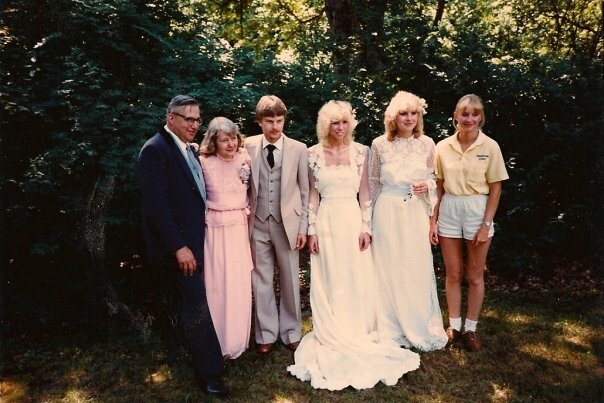 My grandfather (on the far left in the picture above, at my mom & aunt's wedding in 1982 with my grandmother and his four children) was diagnosed with two different cancers when I was in college and he was lucky enough to pull through. Unfortunately, age has caught up with him and he's been unwell more than well the last year. Sparing you all the mundane and personal details, he went in the hospital last week after respiratory failure and my family all gathered together over the weekend to be with him. I am headed back to the city today, but I was reminded this weekend of this post I saw on another blog recently and I wanted to take a little time to be grateful. I am grateful that I have a job that allowed me to come home and be with my family. I am grateful that my grandfather has been lucid and I've been able to spend time with him. Most of all, I am grateful for all the memories I have from childhood, playing at his house with my siblings and cousins, the games we invented, the toys we loved, the plays we put on, the stories he told us. I don't know if I'll get to see him again after I leave today, but the time I've spent home the last few days has meant more to me than anything. I love to read your article Being grateful and it really nice. I love to read this grateful post and i will share this post to all my friends. Get the quality oriented and the best independent College Girl Delhi escorts services from Ruchi just for you to offer extreme pleasure.